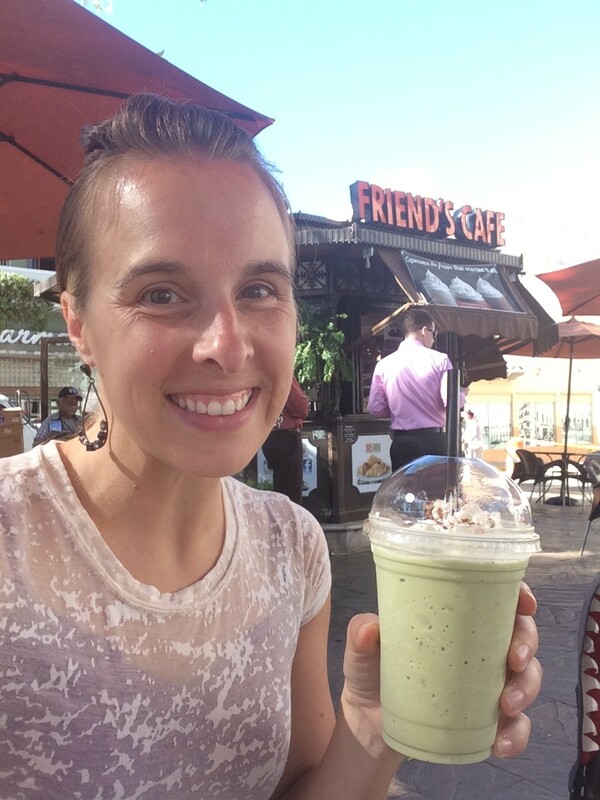 I like Friends Cafe on the Mayaguez square. They make nice drinks. But it happens every time. EVERY time. That creepy guy is always there. Creepy guys I can handle. Creepy guys who slide on over to touch my girl’s head even though she winces, shies away and sometimes cries when he does it, I can’t handle. I don’t go to Friends Cafe very often. Maybe twice a month. And every time I tell myself I won’t let it happen. I’ll let my Mama Bear explode and my demur Midwestern Polite Girl take a hike. Thoughts like, “he’s harmless…he’s just toughing her head…he doesn’t mean anything…” permeate my thoughts. But no. What does my daughter think? Maybe he really is harmless. But all she feels is scared, violated, insecure, and unsafe. She’s two years old. But I let it happen again! I even told the friends I was with, “There’s the guy who always comes over to touch P’s hair.” And then he appeared. He brought over napkins for the kids (nice enough). I should’ve read her body language right there as she cowered into her chair. But before I knew it his hand was on her head, which she was trying to hide, and she began to cry silently. Why the hell didn’t I say something? I’m too damn nice. He didn’t mean harm. I thought maybe this time he wouldn’t. I don’t know how to say “Get the hell away from my child can’t you see she hates you and your actions?” in Spanish. And I’m too damn nice. No more. I let my daughter down, and I knew it. I picked her up, told her she doesn’t have to let ANY one touch her if she didn’t want to. I told her I was sorry, that she was safe now, and I’ll do better in the future. Of course, all my blathering while trying to keep myself from crying made her reaction worse. She cried and cried because she could still see him sitting at a nearby table. As I started to gather our things the man came back, picked up her abandoned smoothie and tried to hand it to her. Maybe he felt bad? But jeez, take a hint and LEAVE US ALONE! I took it outta his hand and said “no toques” which means “don’t touch”. I think I’ll have to skip being subtle. It’s clearly not working. 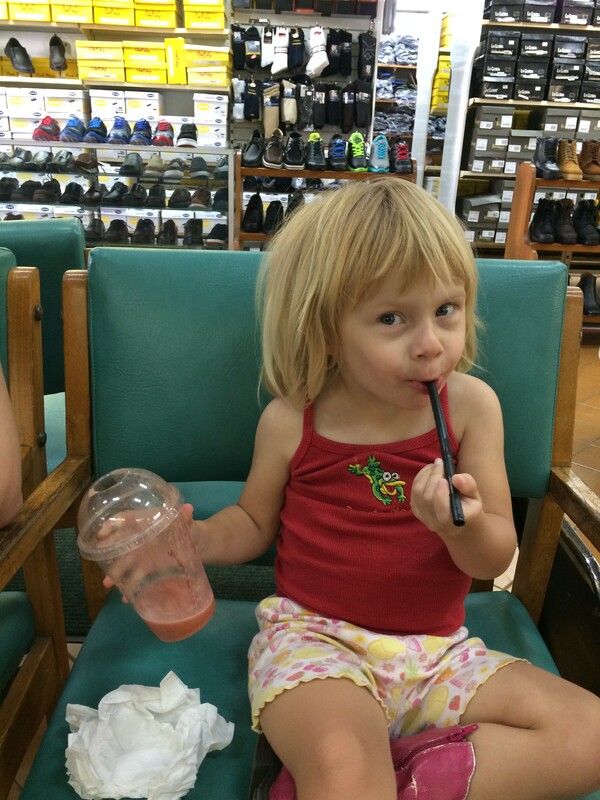 We hit the shoe store across the street where moods improved dramatically. But if you’re at Friend’s Cafe sometime next week when we have more visitors coming, you might hear me being assertive with my new Spanish phrases: Dejala quieta and Ella no le gusta su atencion. And if those don’t work, I’ll just use English. And I won’t be subtle. I think this struck me so intensely because a) I didn’t take action even though I knew what would happen and b) I let shyness/language barriers get the best of me. Lessons learned. This entry was posted in Uncategorized and tagged blonde, Mayaguez, Puerto Rico. Bookmark the permalink. 8 Responses to Leave her alone! Hagame el favor de no tocar ni a mi chico ni a mi chica Carajo!!!! The carajo is a curse word it literally means the male member but in reality it’s translated as an emphatic Damn it!!! Laura – You are doing the right thing to protect her! Don’t let her out of your site if that man is anywhere around. Keep tabs on where he is. I usually would not say something like this publicly, but for your baby I will say it. -When I was very little I remember being terrified of a teenaged boy who paid attention to me. It turned out that there was good reason- he did get me cornered alone one time. Tone of voice works well to send a message. So, use english in those cases where it will come most naturally. Plus, many people know enough english to understand. And, speak up so others around you can hear. Someone may come to your aid. Also, if the guy is loitering around and bothering customers, oftentimes the store/establishment owner/manager will come to your aid. They don’t want their paying customers to be hasseled. Then, mom, take your daughter under your wing, physically protect her, put your arm around her, put her on your lap, etc. That sends a dual message: one to the guy, the other more important to Paige that you are her shelter. Finally, later on, talk to her about the experience, like you did. A few thoughts from Abuelo. Unos abrazos fuertes. Laura I know the old man you are talking about, I saw him in action when I visited you. I really don’t think he is all “there”. My mom instinct told me he was harmless, but obtrusive. I feel you should tell him – or have the your smoothie lady tell him – to please not approach P when he sees her. Explain that she is little and afraid of strangers and his touching her scares her very much and makes her cry. You don’t want her to cry so could he please ignore her when he sees her. He appears a bit simple and I don’t know if he would get the message. Don’t make a scene. Rather try your hardest to talk to him or get someone fluent in Spanish to talk to him. The bigger the scene you make the more horrified P will be. Yes, he is a little scary and creepy, but he is not evil, just a bit slow in picking up social vibes!! Good luck. All good ideas here. You could also, pull her close to you when he comes over and smile but firmly say no while shaking your head. He will probably understand at that point, hopefully. Momma Bear always need to protect our young. Hoping for the best for you and your kids!